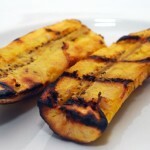 Grilled Plantains are an Ethiopian food recipe. Wash the plantains and cut them in half length-wise and width-wise. Do not peel. 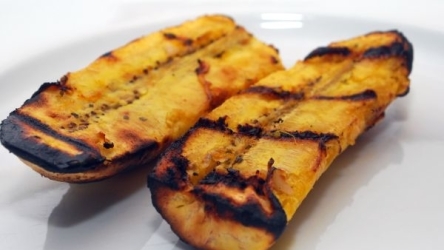 Grill or broil, skin side down, for 5 to 7 minutes or until plantains can be easily pierced with a fork and are not sticky. Flip for a minute or two. When cool enough to handle, peel plantains and serve.